Snakes are long and they are cold-blooded meat-eaters. They are different from lizards because they do not have legs or eyelids or external ears. They do have backbones and their skin is covered with scales. Snake skin is dry and not slimy. Snakes are reptiles, like lizards and turtles. Most snakes have skulls with many joints. These joints are highly mobile and elastic. The joints have enable them to swallow huge prey, even bigger than their heads. Since snakes have a very slender body, they have kidneys which are placed one in front of the other and not side by side like our kidneys. The majority of snakes have only one lung. Snakes are found on every continent except Antartica. There are about 2900 species of snakes. We can even find some very tiny ones, like the threadsnake – only 10 centimetres long (4 inches). Then there are some really huge ones like pythons and anacondas. Researchers have recently discovered the fossils of an enormous snake, the Titanoboa, which was 15 metres (50 feet) long and weighed over a ton! It is the biggest snake ever discovered. The longest still living snake, 9 metres long (30 feet), is the Reticulated Python. The Green Anaconda is shorter, about 7.6 metres (25 feet), but it is the heaviest snake on earth. It can weigh about 97.5 kg (215 lb). Neither of these huge snakes have a venomous bite. The largest venomous snake in the world is the King Cobra. The smallest living snake is the Barbados Threadsnake. It is only about 10 centimetres (4 inches) long. It is as thin as spaghetti! So, you can see that not all of snakes are huge, like the Reticulated Python or the Green Anaconda. Most snakes are quite small, less than 1 metre (40 inches) long. Most snakes are not venomous. Those that have venom use it mostly for hunting rather than to protect themselves. Venomous snakes have special teeth (their fangs) to inject the venom into their prey. A few snakes have very poisonous venom which will can cause painful injury or even death to humans. So, beware of venomous snakes! Non venomous snakes will either swallow the prey alive or kill them by coiling tightly around their bodies a few times. Snakes’ eyes are covered by transparent scales, like spectacles. Their eyes are always open even when they are sleeping because they do not have eyelids. Isn’t that interesting! But their retina can be closed, or they might bury their face among the folds of the body when they sleep. So, if a snake is all curled up in a bundle, do not ever disturb it. It is having its beauty sleep. You will get into big trouble if you disturb it! Snakes shed their skin all in one go, not bit by bit. Before shedding their skin, the snake will stop eating and often hides in a safe place. The inner surface of the old skin becomes wet and this helps the old skin to separate from the new skin. Their eyes will go milky or blue-coloured just before they shed their skin. The shed skin doesn’t have a colour. After a few days, the eyes will be clear again. They shed their skin for two reasons. Firstly, because the old skin need to be replaced. Secondly, by shedding the skin, the snakes are able to get rid of mites and ticks. The old skin tears near the mouth of the snake. The snakes will crawl out of the old skin by rubbing against the rough surfaces. The old skin will be peeled backwards over the body of the snake from the head to the tail in one piece, like pulling a sock off inside-out. Older snakes shed their skin only once or twice a year, but the younger ones will shed up to 4 times a year. You can actually see a perfect scale pattern on the old skin! Some snakes have good eyesight, and others don’t. Snakes which live in trees have the best eyesight but burrowing snakes have the worst. 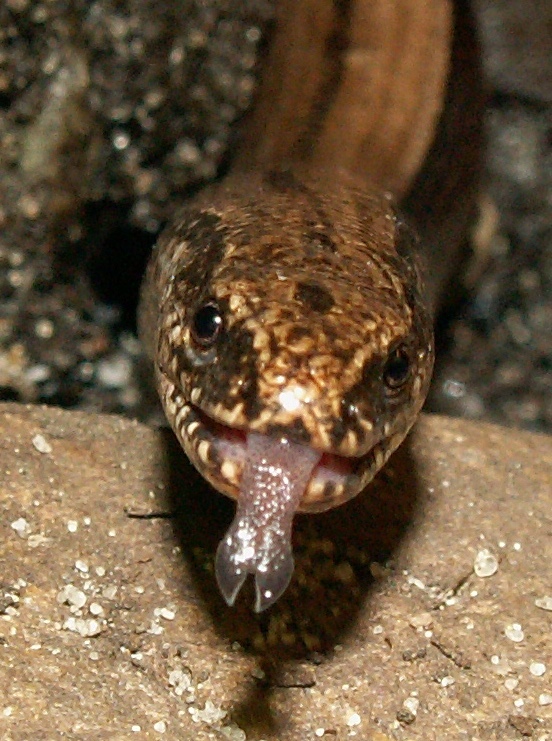 Snakes smell and taste odours in the air with their forked tongues. They keep their tongues moving all the time. The tongue pick up scent particles from the air, ground and water. Since the snake smells with its tongue, it doesn’t smell with its nose – a snake’s nostrils are only used for breathing. They do not have outer ears, instead they hear with inner ears. Have you seen a snake charmer before? A snake charmer will play a tune with his flute and the snake will respond to the movement of the flute – but not the actual noise because the snake does not have an outer ear. The snake’s body, in contact with the ground, is very sensitive to vibration. Therefore a snake can sense the vibration of any animals which are near them. Some which are active at night, like Pit Vipers and Pythons, have heat sensors to help them to locate the warm-blooded birds and animals which they hunt. Cobras and vipers use venom to kill their prey. The venom looks like saliva and it is injected through their fangs. If a non-venomous snake bites, it will still cause damage, just like a bite from any other animal, but only venomous snakes inject poison..
All snake are meat eaters. They eat small animals like lizards, frogs, other snakes, small mammals, birds, eggs, fish, snails or insects. There are birds, mammals and other snakes (for example the King Snakes) that hunt and eat venomous snakes, and their bodies have developed resistance and immunity to the venoms. Snakes cannot chew or tear their food to pieces, they have to swallow their dinner whole. Since that is the case, smaller snakes will eat smaller prey. Young pythons will only eat lizards or mice, but as they grow bigger, they will hunt for a bigger victim, maybe a pig or a deer. Snakes have a very elastic lower jaw which allow them to open their mouths wide enough to swallow their prey whole. They can even swallow prey which is larger in diameter than the snake! Example, the non venomous African egg-eating snake which is found in Africa has a elastic jaw which is made for eating eggs much bigger than the size of its head. The snake has no teeth but does have bones which are pushed outward on its spine, which it uses to break the shells after it swallows the eggs. The majority of the snakes in the world eat all kinds of animals. But there are some snakes which only eat snakes! For example, King Cobras and the Australian Bandy-Bandy eat other snakes. Isn’t that silly! Snakes that eat snails have more teeth on the right side of their mouths than the left side because the shells of their prey are usually spiral clockwise. Some snakes have a venomous bite and they will inject the venom into the prey and kill it before eating it up. Other snakes kill their prey by coiling tightly around them and some snakes are just heartless, swallowing their prey whole and alive. After feasting, snakes become inactive. It is as if they are sleeping. During this inactive period, they digest their food the belly of the snake. It will be an intense process, especially if the greedy snake has just swallowed an animal bigger than itself! Since snakes are cold-blooded, the surrounding temperature affects the snake’s digestion. The best temperature for the snake’s digestion will be 30C (86F). So, the snakes must actually increase its metabolic rate in order to make sure that they are able to digest what they eat. During this period of intense digestion, if the snake is threatened they will vomit their prey so that they are able to escape and protect themselves. I guess because if they are too heavy with a belly full of lunch, it would make it harder to run away and avoid becoming something else’s lunch! If the snake is left alone to digest its food properly, the snake’s digestive enzymes will dissolve and absorb everything except for the prey’s hair or feathers and claws. These come out later in the snake’s poo. Although the snakes does not have legs, they can still move along by slithering. They use their special belly scales to move along. Their body’s scales may be smooth or rough. They have a few different ways of movement depending on where they live. Most of snakes use “lateral undulation” which means “side to side wavy”. When they move the snake’s body bends to the left and right, making wavy patterns that helps the snake to move forward. All snakes that live in or near water move like this, and so do most who live on land. The slowest mode of snake movement is “rectilinear”, a slow, straight forward movement. In this mode the snake does not need to bend its body from side to side. This mode of movement is often used by large pythons, boas and vipers when they approach their prey on flat open ground. By using this slow mode of movement, the prey find it harder to detect the coming of the hunter. Snakes which live amongst tree branches use different modes depending on the type of the tree and the texture of the bark. They will use the concertina mode on smooth branches but will bend from side to side in wavy motions if the branch is rough or knobbly. Snake move slower on large branches and smooth ones. Most snakes lay eggs. The mother snakes generally abandon the eggs after laying them. Most pythons will coil around their eggs until they are hatched. A mother python will not leave her eggs unless she needs to bask in the sun or drink some water. She will even “shiver” to generate heat to incubate the eggs. What a great python mother! The King Cobra is the champion of all snake mothers. Unlike most other snakes, she will actually make a nest and stay near the baby snakes for some time after they are hatched. Ensure the snake is not going to bite again (most snakes will not, if they are left alone). Don’t try to kill the snake and risk another bite! Make sure the victim is calm. If nobody panics, it will be all right! Stay calm yourself. Call for an ambulance, explain that someone has been bitten by a snake, and explain exactly where you are. Make sure the bitten limb remains below the victim’s heart and other organs. Don’t give the patient any food or drink or medicine until the doctor arrives. Especially, don’t give alcoholic drinks! Make sure, if possible, that you know what type of snake it is. If the snake is dead, it can be shown to the ambulance staff, but don’t try to kill the snake if it’s not safe to do so. One snakebite is more than enough!! In the USA, they also recommend washing the snakebite with soapy water, but in Australia they recommend you do not wash the wound at all. You should not cut the wound or try to get the poison out. Some venomous snakes are very dangerous and can kill people. A person may need to amputate of a limb that was bitten by a venomous snake. So, stay away from venomous snakes! Out of the 725 species of venomous snakes in the world, only 250 are able to kill a human with one bite. Australia is famous for venomous snakes, and there is one fatal snake bite per year. However in India there are 250,000 snake bites each year and 50,000 of these end in death. And that’s just the ones that are reported! Since a venomous snake’s bite can cause death or serious injury, it is important for us to learn how to treat it fast. The steps above show what you should do. At the hospital, the most common and effective treatment is through an anti-venom – it is a serum made from the venom of the snake. In the western countries, tame snakes like ball python and corn snakes are kept as pets. They are quite cheap to be look after – you do not need spend much on food for them. They only need to be fed once every 5-14 days and they do not require a big space to live in. Some of these pet snakes can even live more than 40 years if they are taken good care of. Snakes are also part of the diet for some cultures. For example, snake soup in the Cantonese cuisine is known to be great during the autumn season because it keeps your body warm after drinking it!